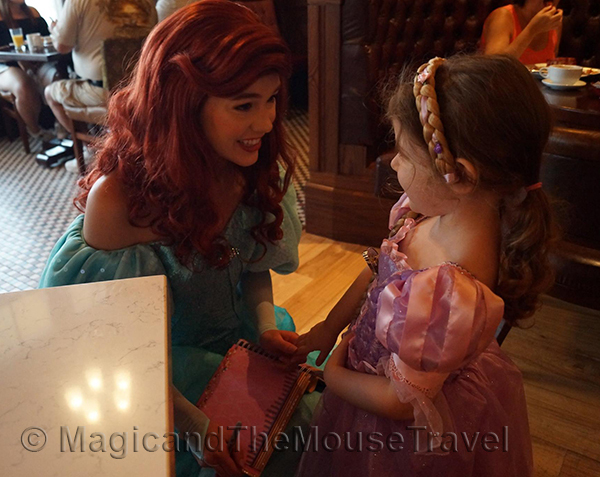 Last Sunday we experienced the all new character breakfast at Trattoria al Forno Restaurant at Disney’s Boardwalk: the Bon Voyage Adventure Breakfast. 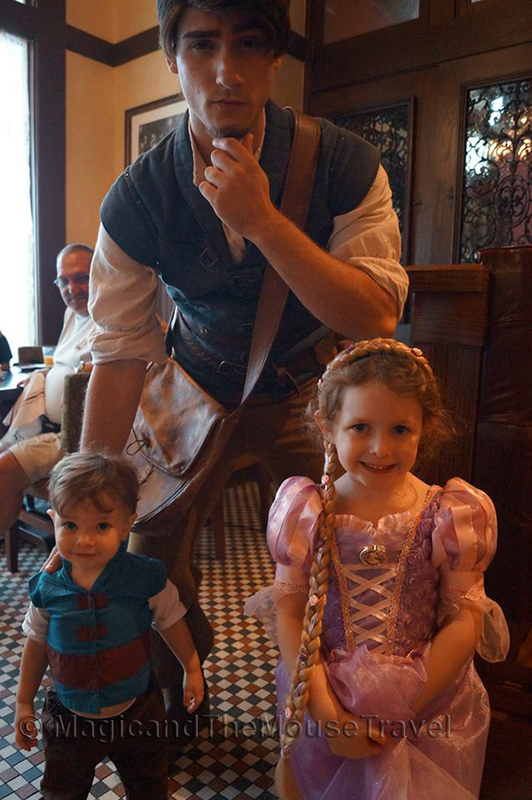 I was definitely looking forward to it because I love Flynn Rider, and it’s the only place on Disney property to interact with him as well as Prince Eric. 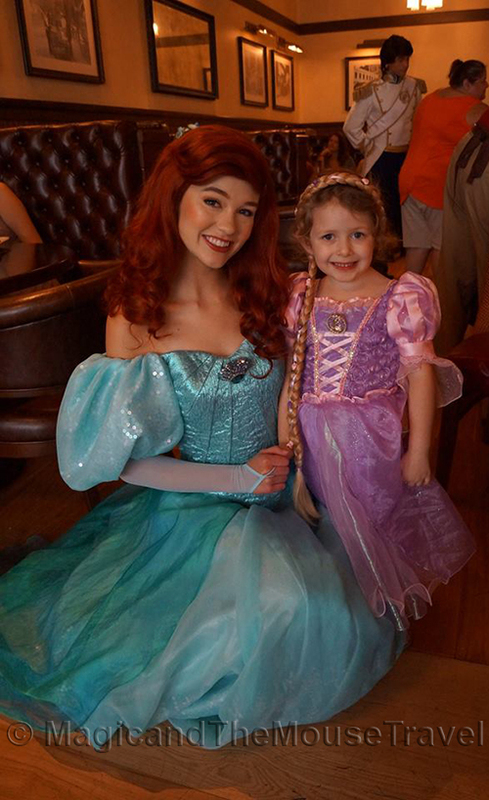 Ariel (in human form) and Rapunzel were also there to welcome us. The restaurant is themed Italian for lunch and dinner, so I thought they did a wonderful job for breakfast not playing that up too much, and instead themed it as an Adventurer’s Breakfast. I also liked that there was a merchandise cart in the lobby with autograph books, pens, and other Ariel/Rapunzel themed options so if this is your first stop on your vacation, you can begin your autograph collection right away. We received a map to help us document our adventures all around the resort. Once seated, our server was attentive to my husband’s food allergy (soy) and asked the chef to visit our table. The breakfast menu had touches of Italian flavor throughout. 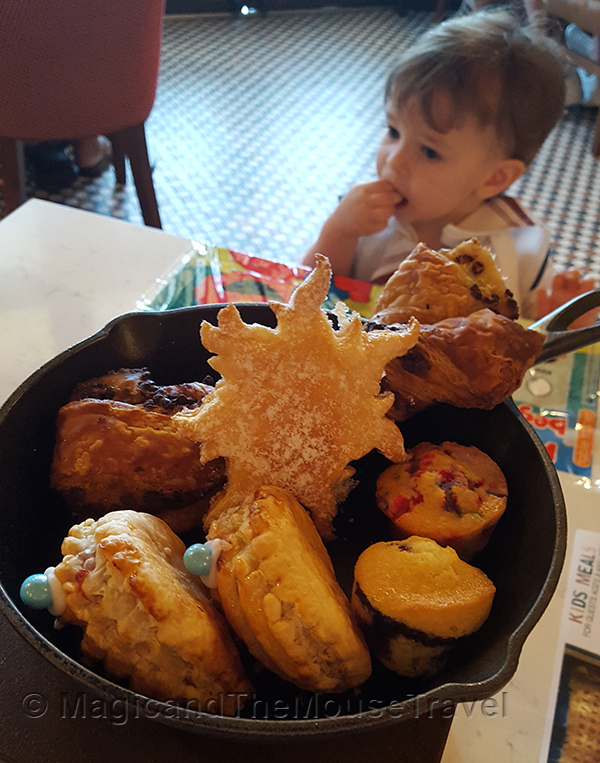 Small touches like pastries served in a frying pan (who knew?!) 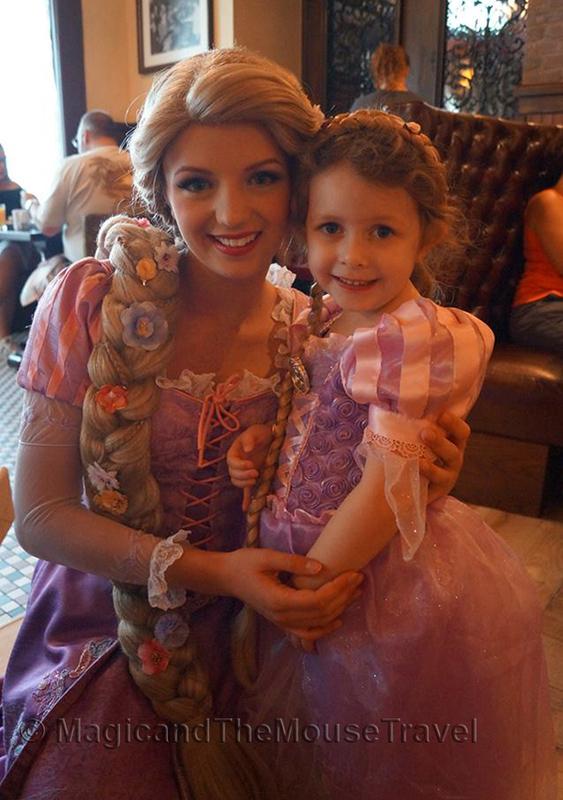 with Rapunzel’s kingdom’s symbol and ones with sea pearls were adorable as well as tasty. I ordered the Tangled eggs, which was mozzarella, tomato-basil scrambled eggs, and Sunday gravy with roasted potatoes and Bacon, and it was delicious. The kids got Flounder’s Flapjacks, while the hubby was able to have Mickey waffles. One by one the characters joined us. We were seating towards the rear of the restaurant and as they entered the room, we were one of the first stops for table visits. 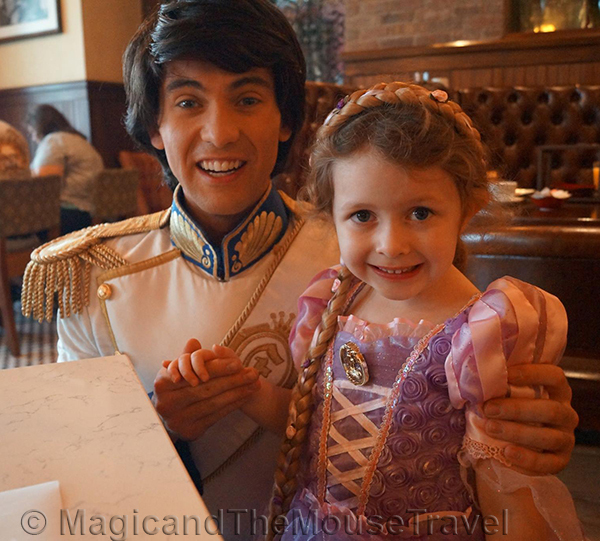 They signed our daughter’s princess autograph book and took photos. But what I love most about character interactions is the immersion into their world. They spoke with our kids, asked questions, danced and twirled with our daughter. 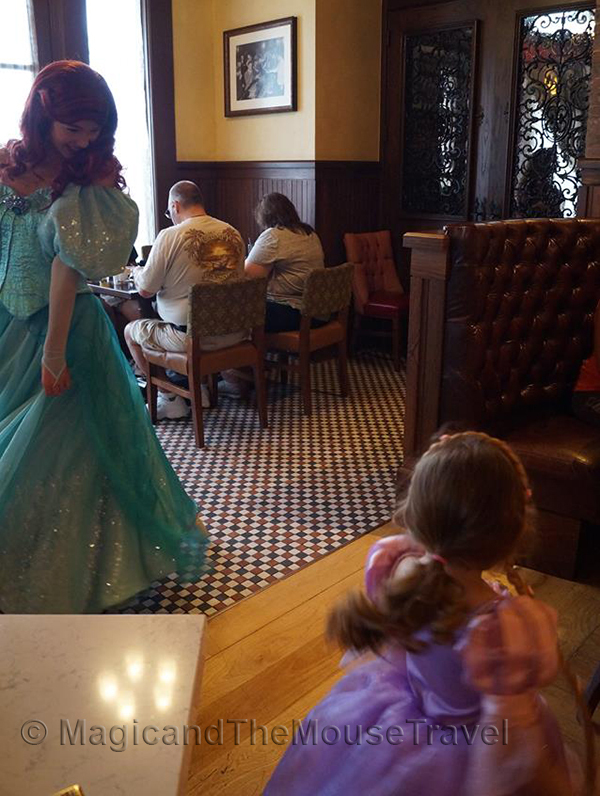 Ariel chose our daughter Lily to lead the Under the Sea parade around the restaurant. The Boardwalk is usually quiet as well in the morning, and the kids (and us!) love walking around the area to see the stores and the boats. 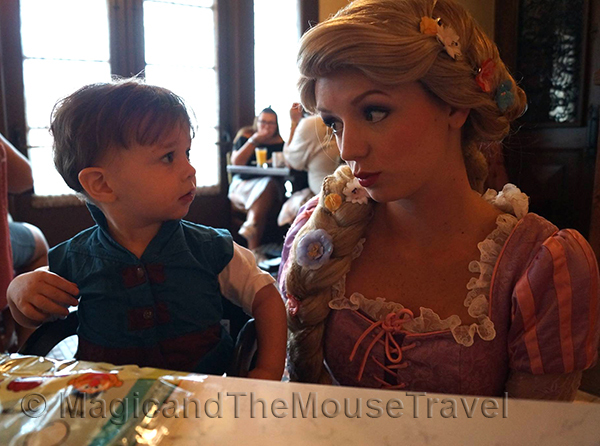 We will definitely be back to Trattoria al Forno for breakfast! 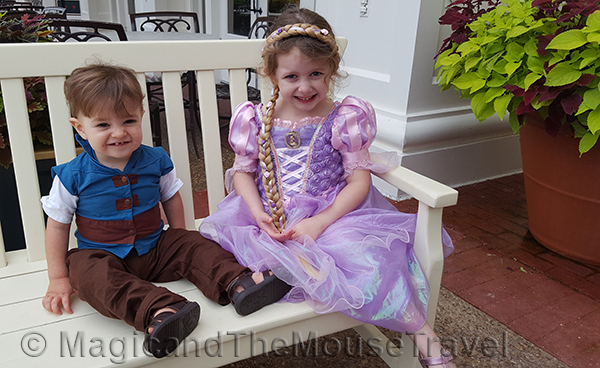 Contact me today to book your stay at the Walt Disney World Resort, along with Character Dining Experiences!